There were so many little details about the wedding that I *love*. It was all the little details that really made it special, I think. The his & hers Converse sneakers with the date on the back, Alex's "music note" cuff links, the record player groom's cake, the daisies, the polka dots, the pearls...the music! One of my favorite things was our wedding favors. You have no idea how much we agonized over the wedding favors. At first I couldn't think of anything that truly represented us that we could give away. When I went searching through the internet, I found nothing. All the favors seemed so cheesy. Everything I came across seemed like something that NO ONE would appreciate. Finally, I decided to forget it. I wasn't about to waste money on cheesy favors that no one was going to want anyway. We should make a CD filled with all our favorite (non-cheesy) love songs. We love music and we love sharing music with everybody, so this would be the perfect favor. Alex found these cool vintage looking CDs. 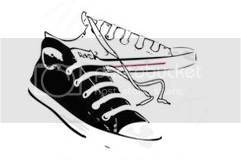 Steph designed the neat converse sneakers logo which we printed on stickers to keep the covers shut. It makes me really happy [and humbled] that so many people have expressed a love for the CD. Apparently people are ACTUALLY listening to it...more than once. And that gives me so much joy. It's good to know that something you worked so hard on is appreciated. Oh and if you haven't seen the photo slideshow, I don't know what you're waiting for!